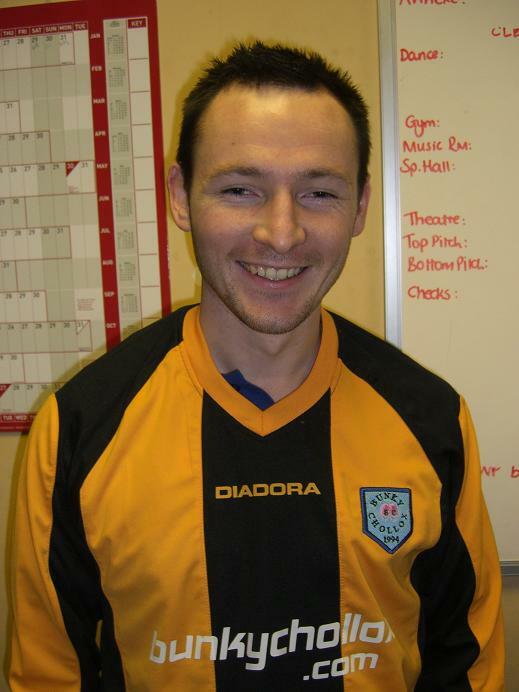 Neil joins Bunky's for the 2011 season. We've had a few laughs with Neil over the years, see below. The social side of Neil..
Umm, now what shoes should I wear?? The football side of Neil..
Bunky Chollox parade their new midfield ace, Neil McGlory, signed yesterday from Athletico Shenley for an undisclosed fee. McGlory completed a medical earlier in the day and expressed to journalists "This is a dream come true. I've grown up watching Bunky's and I can't wait to finally pull on the red shirt and show the boys and the fans what I can do. Everything about this move has been brilliant and the calibre of the squad here can only help me improve my game". Gareth Davies, Bunky Chollox' Chairman, said of the deal "This is a major signing for the Club. We are delighted that Neil has agreed to join us and it clearly demonstrates the intention of this Club to continue competing for every honour in the game." It is also believed that Bunky Chollox are in negotiations for further players before the start of the season but the Club last night refused to comment. Neil McGlory, flanked by Gareth and Sean signs a four year deal and becomes Bunky's first major signing of the close season. Here's how the 'Daily Mirror' and 'Sky Sports' covered the story. Further pics from the Press Association follow, click on any to enlarge.